Stock # B40116, 6.7L Power Stroke V8 Turbo Diesel B20 Engine, Automatic, 58536 mi. 2017 Ford Super Duty F-350 DRW Lariat Edition 4x4 6.7L Powerstroke V8 Turbo Diesel 6 Speed Automatic Transmission Fx4 Off-Road Package 3.55 Ratio Limited Slip Axle Navigation W/Back Up Camera Rear Cargo Camera Heated / Cooled Front Seats 17" Wheels W/ Cooper Tires Power Running Boards Ranch Hand Front Bumper Tow Package 14,000 GVWR Package 1 Owner Clean CarFax 1FT8W3DT7HEB40116 We END Auctions with just ONE phone call! CALL NOW 1-800-336-9485 Financing Available Rates As Low As 2.29% *WAC Motorcars of Dallas is proud to offer this 2017 Ford Super Duty F-350 DRW Lariat Edition. The exterior color is White with Camel leather interior. 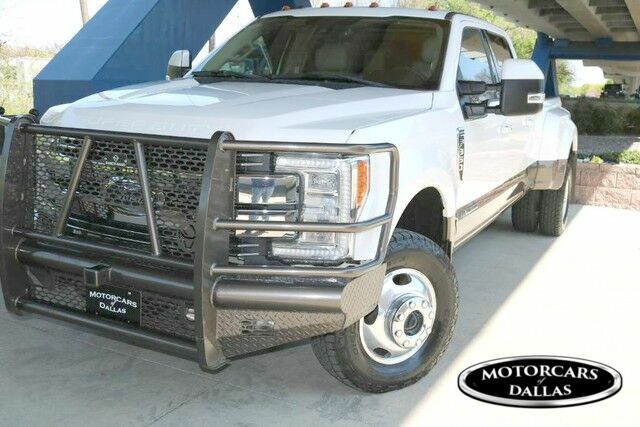 This Ford Super Duty F-350 DRW is powered by the 6.7 turbo diesel engine, has an automatic transmission and 58,536 miles. All options are in working order which include navigation, panoramic sunroof, wood trim, single CD, auxiliary jack, tow package, heated seats, cool seats, power driver seat, power passenger seat, memory seats, remote start, back up camera, heated mirrors, Sony audio system, bluetooth, power running boards, bedliner, cruise control, tilt, 4x4, satellite radio, home-link, power windows, power locks, power mirrors, back up sensors, spare tire, 17 inch wheels with matching Cooper tires, 2 factory key, original owners manual, floor mats. Motorcars of Dallas is a premier used car dealership in Dallas, Texas offering a huge selection of lowest payment luxury used cars and best price custom trucks in the Dallas/Fort Worth area; including Carrollton, Addison, McKinney, and Plano. We understand that you have numerous used car dealerships to choose from and several pre-owned vehicles, however, allow Motorcars of Dallas the opportunity to provide you with one of the largest inventories of best priced, high-end, quality, used custom trucks and cars in Texas. We promise to make this the easiest custom truck or car buying experience possible - the feedback that we receive from our satisfied customers prove it! Our Dallas best price custom truck inventory for sale includes lifted Chevy trucks, Ram diesel trucks, Ford dually trucks and 4X4 GMC trucks! All of our best price custom trucks and cars purchased by Motorcars of Dallas have a 131 point safety inspection performed by an independent ASE certified mechanic at Performance Center of Dallas. If there are any mechanical issues noted during the inspection they are fully addressed before the custom truck or car is sold and any issues that Motorcars of Dallas elect not to fix are fully disclosed or pictured in each listing. Please keep in mind that these custom trucks and vehicles are used and could have some cosmetic imperfections, light scratches, and normal wear and tear which do not hinder safety or its performance. Motorcars of Dallas does our absolute best to point out any shortcomings and note them in each best-priced custom truck Dallas listing and to make sure that the vehicle is represented as best as possible. We take a minimum of 60 pictures for each custom truck or car. Each car or custom Ram, Ford, Chevy or GMC truck that arrives into Motorcars of Dallas is professionally cleaned and restored by means of paintless dent repair, hand clay baring, shampooing of carpets, seat reconditioning and our 3-step buffing & waxing process. Motorcars of Dallas wants you to enjoy your buying experience 100% and encourage you to ask any questions that you may have by contacting one of our exceptional sales representatives. We always strive to offer our best price possible on every custom truck we have for sale in Dallas, TX and get you our lowest payment plan! Motorcars of Dallas looks forward to providing you with any information you need in order to feel comfortable doing business with us. Call 800-336-9485 or E-Mail today with any questions you may have about any of our pre-owned cars or custom Ram, Chevy, GMC or Ford trucks. For those of you from out of town, Motorcars of Dallas offers complimentary pick-up from either DFW Airport or Love Field Airport. We also can assist you with great financing, extended warranty options shipping throughout the world! If you live in Dallas, Garland, Arlington, Carrollton, Lewisville, Highland Village, Frisco, McKinney, Prosper, Denton, Rockwall, Rowlett, Plano, The Colony, Grapevine, Colleyville, Euless, Hurst, Bedford, Aubrey, Sanger, Krum, Justin, Southlake, Sachse, Wylie, Mesquite, Weatherford, Fort Worth, Burleson, Duncanville, Roanoke, Mansfield, drop by the Motorcars of Dallas showroom or call ahead if you would like to schedule an appointment or test drive of your favorite best-priced custom truck. All advertised prices exclude government fees and taxes, any finance charges, any dealer document preparation charge, and any emission testing charge. The price for listed vehicles as equipped does not include charges such as: License, Title, Registration Fees, State or Local Taxes, Dealer Prep, Smog Fees, Credit Investigation, Optional Credit Insurance, Physical Damage of Liability Insurance, or Delivery Fees. DEALER makes no representations, expressed or implied, to any actual or prospective purchaser or owner of this vehicle as to the existence, ownership, accuracy, description or condition of the listed vehicle's equipment, accessories, price, specials or any warranties. Any and all differences must be addressed prior to the sale of this vehicle.